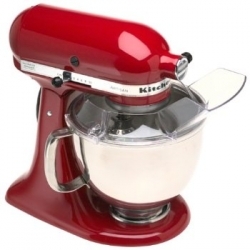 The Artisan mixer's strong 325-watt motor delivers the power to handle the heaviest mixtures, and mix large batches easily. The 5-quart polished stainless steel bowl with ergonomic handle is big enough to handle large batches of heavy mixtures. Its ergonomically designed handle is contoured to fit the hand and makes lifting the bowl more comfortable. 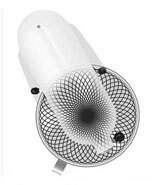 The beater spins clockwise as the shaft spins counter clockwise; moving the beater to 67 different points around the bowl. This unique mixing action creates a thorough blend of ingredients and eliminates the need to rotate the bowl. 10 speeds allow the user to select the right speed for the mixing job; from very high to very slow stir. It's easy to select the precise speed needed for a perfect mix. 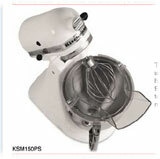 The flat beater, dough hook, and the professional wire whip add to the versatility of the mixer. The flat beater is the ideal accessory for mixing normal to heavy batters. From cake mixes to firm cookie dough, the flat beater mixes quickly and thoroughly. The pouring shield fits around the top of the bowl and prevents ingredient splash-out. The chute makes it convenient and easy to add ingredients.